One of the big buzz posts this week comes from Read/Write Web, and it does a great job of explaining why chasing “long tail” topics as a blogger is a bad move when it comes to making money. In other words, there’s certainly money to be made from the long tail (by aggregators such as Amazon, Netflix and b5Media), but very little money to be made by the individuals who actually create free content in ultra-niche topic areas. It has occurred to me recently that the term “long tail” has caused independent publishers more harm than good. Wired editor Chris Anderson coined the term to emphasize the power of niche publishing, but those who benefit from it most are aggregation companies like Amazon and Netflix who charge money for long tail items and profit by selling less of more. There’s nothing new about niche marketing that any successful online marketer needed to hear in The Long Tail—it’s been that way for smaller players since the early days of the Internet and well before. But the key is selling specialized information, not giving it away. Somewhere along the line people have gotten confused. You don’t want to produce free content for a tiny audience, you want to charge a small but sufficient group of people for content that is in sufficient demand. What you want is a unique niche offering, not a niche audience. You need a large enough potential audience to profitably market to. You won’t attract all of that potential audience, and in fact you’ll only attract a tiny percentage. But if you’re an independent publisher, you don’t need to sell to anywhere close to everyone to make a lot of money. I’m speaking in the context of membership sites and information products in the report, but the same goes for choosing blog topics if you plan to chase advertising. Copyblogger is certainly a niche blog, but the potential audience is every commercial blogger, online marketer and small business person with a web presence, which amounts to many millions of people. Will I reach them all? No, of course not. But you need that potential reach just to carve out a large enough audience to have a shot at significant advertising revenue. And even now, after almost two fantastic years, advertising revenue from Copyblogger is a drop in the bucket compared to what I can do because of Copyblogger. Ditto. I appreciate your continued attention more than you know, and that’s why I would happily maintain this blog even without a dime in advertising revenue. Next article: Are You Someone’s User-Generated Content? Thank you, Brian, for your never-ending stream of quality content. So, needless to say, Copyblogger is making no money, and you’re about to pack it in. After all, a blog about how to write for blogs is a small niche. And obviously you can’t make any money writing a niche blog, since there’s no long tail. a blog about how to write for blogs is a small niche. Who said that’s what this blog is about? As for the rest of your comment, I think it shows you didn’t understand what I wrote. 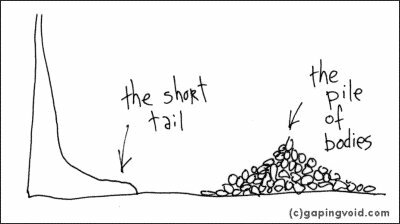 However, the concept of the long tail helped me think through the process. And in our membership site, at http://www.5000bc.com we have tons of articles. So what I did instead, was start to apply the long tail concept to the membership site, enabling customers to find articles better. Which means that if you were searching for a concept like ‘pricing’,then instead of search coming up with a whole bunch of articles (that may contain the word ‘price, pricing etc, but may not be related to pricing), they came up with specific ‘pricing’ articles. 2) Enabling users to find the content. This of course doesn’t apply to revenue. But concepts are concepts. And finding the use for a good concept is far more important than simply shooting it down. I think the revenue model works for some businesses, but what needs to be considered as well, is the various applications of the long tail. Well said, I commented on the Read/Write post that I didn’t really think most blogs were for money, and that it had the wrong mindset. As always, you are on the money. But, hey that’s why you are #1 on Ad Age! Hi Brian, I got it, and I thank you for both clarifying the long tail topic, something that has been talked about so much in the blogosphere, and also for getting your message across to us that you love being able to provide us with valuable content. There’s a reason that so many are reading and paying attention to Copyblogger! I agree that long tail may not work if you are trying to make money at blogging. Unless of course, the only advertiser on the blog is yourself. Take a real estate agent for instance. Todd, that’s a good point, but I would tend to think of business bloggers as a separate category. Using ezines and now blogs as a lead-generation strategy is much different–and much more successful–then trying to make money with advertising supported niche content. Having something to sell is key. You hit it on the nail when you spoke about having a potential reach that big enough. Online profitability hinges on identifying a target market that sizeable enough to create profit incentive. Thanks for your insight. I look forward to reading what you have to say…everytime. Thank YOU, Brian. This blog is where it is because you are a superb writer and a highly perceptive individual. I believe those two attributes will carry you to incredible heights. Stick with it! Brian you hit the nail on the head. I have started a few niche blogs hopping to start making enough money to leave the nine to five, and your post hit it home. It’s not niche audiences I should be targeting but rather niche topics, that are relevant to a larger audience. Looks like its time to go sell some domains and start over. It seems, the point being, if you can find a hungry audience with an offering they actually want- you will succeed. After all, i might be the hungriest person in the world, but I’m not about to eat something I don’t like. Perhaps it is just a matter of looking at the long term career and networking benefits, than just focusing on immediate dollar revenue. Keep in mind that the WSJ and the New York Times are NOT niche publications… in fact, they’re quite the opposite. They can make more money from advertising than subscriptions, because they are huge brands that publish news and opinion, which is commodity content that most people refuse to pay for anyway. Niche publishers produce specialized and expert content, and that is usually best charged for. The Long Tail concept (by no fault of Chris Anderson) has people thinking completely backwards to their own detriment. True, but what a shock that must have been for them as an industry, after decades of people paying them for the physical newspaper everyday. Anyway, that is another topic. Great post. Thank God for clearing this out. I’ve been struggling to understand and adapt my blogging to take advantage of “the long tail” but to avail. For now, just focus on creating good content will be my priority. Man, what an idiot. He refuses to see the value of niche angled content that is clearly bringing in money for you, Brian. Very helpful post! My blog is purely information based! I have no interest in advertisements! Since I’m a sharpener, my blog is geared toward other sharpeners. Talk about a small niche! But blogging has been a great tool that helps me promote a subscription newsletter I write for the sharpening industry, equipment I sell and I plan to start promoting training videos after the first of the year. My niche audience may be small (so this doesn’t fit well with your advice about a large audience), but there is great demand. It looks like I’m heading in the right direction with what I’m trying to do with Jim Sharp, but you’re also inspiring me to enlarge my view of the world blogging! Thanks for the encouragement! Brian, having read the article on Read/Write Web and skimmed the comments quickly, most folks seem to be focusing on the role of aggregators in making massive profits from the collective buying power of the long tail market. I’ll use a real example of mine (without revealing the niche). There’s a market I am in. The entire GLOBAL prospect base is around 15,000 people – of which, reasonably, one might expect 10% to be online (that’s 1,500 people). I have an infoproduct targeting this niche. It has just 40 pages, but very specialized information. It sells for $39.95 as a digital download. I dominate this niche on search results from a mini-content website built in 1997 – and never updated since! The ‘long tail’ concept gives hope to infoproduct creators like me who go after such MINISCULE niches – because the low cost of digital delivery and Internet access drop customer acquisition and product fulfillment costs to rock bottom… making it possible to make reasonable profits IN THE LONG TAIL. The downside, of course, is that it can never scale up. There is a definite upper limit to the market. And this, in itself, is helpful – as competition is easy to deter, with potential being small enough to make the idea of entering against an established player relatively unattractive for the late-comer. Just a different perspective on viewing the long tail. Dr. Mani, I think you just proved my point. You’re selling the information, and that’s all the difference. Of course, the only way to scale that is to keep creating new niche ebooks and reports, and selling them. Over time, you’d have a nice portfolio of niche products. I agree absolutely there with you, Brian, guess part of my comment was a response to the Read/Write Web article which seemed to be saying there’s NO money IN the long tail… there is, but you’re right, the ‘marketing’ technique there isn’t a ‘moving the free line’ method. The ‘funnel system’ based on giving away gobs of free content works on the presumption that a small fraction of your market will eventually give you money. So you get as big a section of it into your funnel by giving away stuff for free – including on a blog. The long tail ‘narrowly defined niche’ approach is quite different, as there is a definite limit to your prospect base – and your only chance at making it work is to sell to as high a part of it, at as low a cost as you can afford, for as high a price as you can get them to pay! A real-life example I can point to is my friend Frank McKinney, the maverick real estate developer in Florida… http://www.frank-mckinney.com Frank sells $50 million dollar mansions – ON SPEC. His world-wide market has fewer than 5,000 serious prospective buyers. His marketing targets them, and not many others. Surely he can’t afford to run ‘open days’ for the crowds! Nice point, Brian, this is just to kind of hammer it home. ‘Free to fee’ is NOT a great approach for narrow niches in the long tail. But that’s what ‘subscription blogs’ are for… I’ll be writing more about them shortly. I agree that in many cases pure long tail blogging may not be a great idea, but like Todd said (above), it depends on the PURPOSE of the blog. As a Real Estate Agent, my long tail posts make me more money … actual $$commission$$ … than my general real estate posts. But, like you said, it is because I am SELLING something. But all that said, you are VERY right about longtail blogging in general. I agree that chasing the long tail is for those whose short tail is lacking, just by basically blogging aren’t you going to naturally incorporate the long tail anyway?? Pretty much what REBlogGirl says. I agree with Mariana – as a Realtor, long tails attract more specific searchers. thanks for the info. worth reading. after all of this, that, and tons of doubts, now I understand about Longtail.